People are constantly setting themselves apart from traditional ways. this would be a perfect way for the car aficionado to express their love for cars. aficionado to rest in a true piece of art, personality and style. muscle cars from the 50s to some of today’s most stylish models. 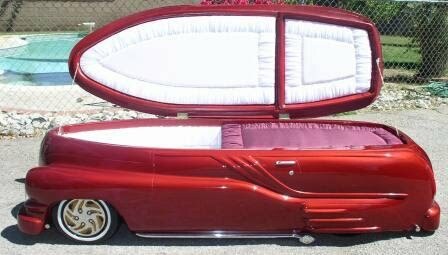 Fully functional casket with pull bearer bar and poles. before it is put to its permanent use. This ice chest conversion may be made possible by utilizing a replaceable liner kit. 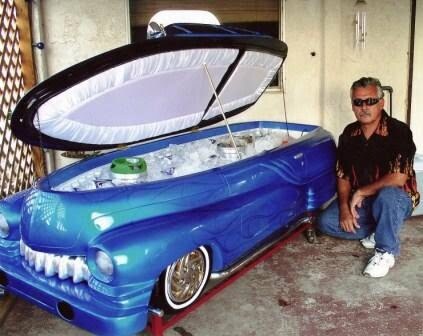 Inventor pictured above with cooler conversion model.